There’s an automotive cliché out there stating that the Jeep Grand Cherokee is America’s take on the Range Rover. That’s actually half true. Sure, Jeep’s big guy SUV can indeed brawl through a muddy back road and get itself out of serious trouble just as well, if not better, than Britain’s Fox Terrier-approved luxury rock climber. But unless you opt for the Summit trim level, like the one you see here, its level of luxury and sophistication is nowhere near as close as that of its European counterparts. Curious to see where one of the Grand Cherokee’s upper-class packages stands in a world of super sumptuous Rovers, BMWs and Volvos, I took one out for a drive. 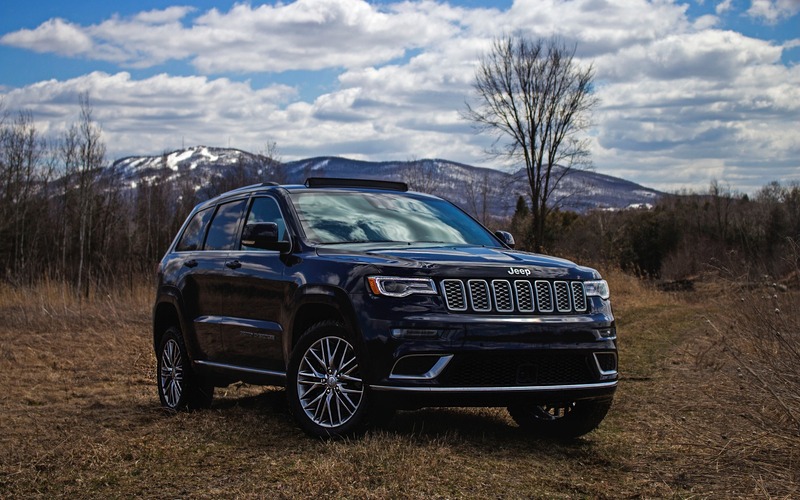 Sitting near the top of the Grand Cherokee food chain with a starting price of $62,045 (before freight and destination), the Summit is the highest available trim level before entering SRT and Trackhawk territory. Summit Jeeps distinguish themselves visually with a set of 20-inch, BBS-style aluminum wheels, LED fog lamps, a fancy premium grille as well as chrome inserts and mirrors. And frankly, it looks good! Inside, the luxury theme continues with Natura Plus leather seats with perforated inserts and embroidered Summit logos, a suede-like headliner, accent stitching, illuminated Summit door sills, active noise cancellation, a Harman Kardon premium sound system with rear-seat DVD entertainment, and a full battalion of semi-autonomous safety tech. It all adds up to a frankly inviting place to spend some time in. Three engines are offered for all Summits; a 295-hp 3.6-litre V6, a 240-hp 3.0-litre turbo-diesel V6, and a 360-hp 5.7-litre HEMI V8. My tester had the latter. V8 power brings torque up to a lofty 390 lb.-ft. 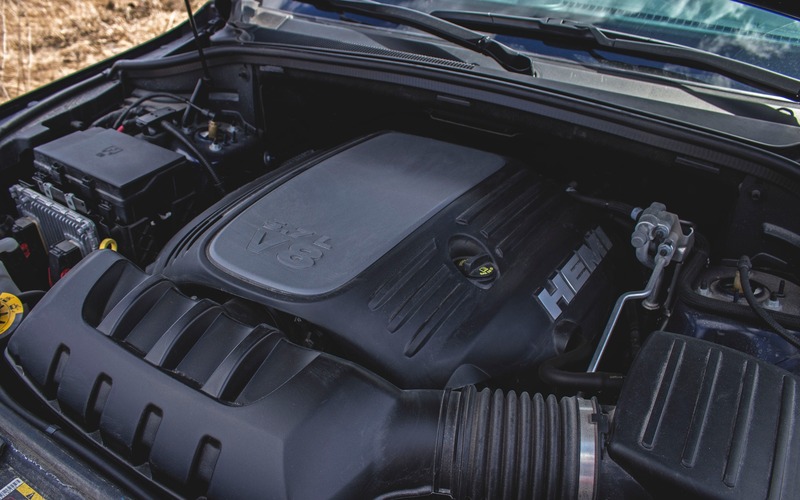 While not as mighty as the turbo-diesel’s 420 lb.-ft., it’s still a 130 lb.-ft. increase over the standard V6, all while delivering a much smoother and refined power delivery throughout the rev range, as well as a rather pleasing intake snarl. Only one transmission is available for the V8—FCA’s ubiquitous eight-speed automatic. Summit variants come fitted with steering wheel-mounted paddle shifters to help maximize the engine’s available power. While it’s not a Trackhawk, a V8-powered Grand Cherokee is still no slouch with a 0 to 100 km/h acceleration time rated at 6.5 seconds. While those enormous leather chairs and quiet cabin do a lot to transform the 2018 Jeep Grand Cherokee from a Moab bully to an alluring boulevard cruiser, the overall impression behind the wheel is of a much more rugged and rudimentary vehicle than its European counterparts. But that’s not entirely a bad thing. Let’s begin with the good stuff, because they are a few. That HEMI V8 remains a gem, not only in the power department, but in its smoothness of operation and impressive frugality. Thanks to cylinder deactivation, this V8 pulled a satisfactory 13.5 L/100 km combined average, making it more fuel efficient than the V8 found in a Nissan Armada or a Toyota Sequoia. Heck, it’s even almost on par with Ford’s EcoBoost V6 found in the Expedition. Acceleration is a Grand Cherokee strongpoint thanks to its engine, but that ZF-sourced eight-speed automatic operates well when comes time to extract the available torque, all while conveniently upshifting to the highest cogs for maximum fuel economy. It does lack refinement, though, clunking awkwardly when downshifting at low speeds. Occasional delays between the moment you gun the throttle and when the darn thing downshifts are another irritating trait. The same can be said about the truck’s handling, which is bipolar to say the least. Overall, thanks in part to the Summit’s air suspension; the vehicle is smooth and hovers over bumps in a cloudlike demeanour. That’s quite pleasant. But it’s still a much choppier ride than anything European or Japanese. Rough road sections send shivers through the chassis and cabin, with unwanted wobbles and excessive body roll sprinkled on top. 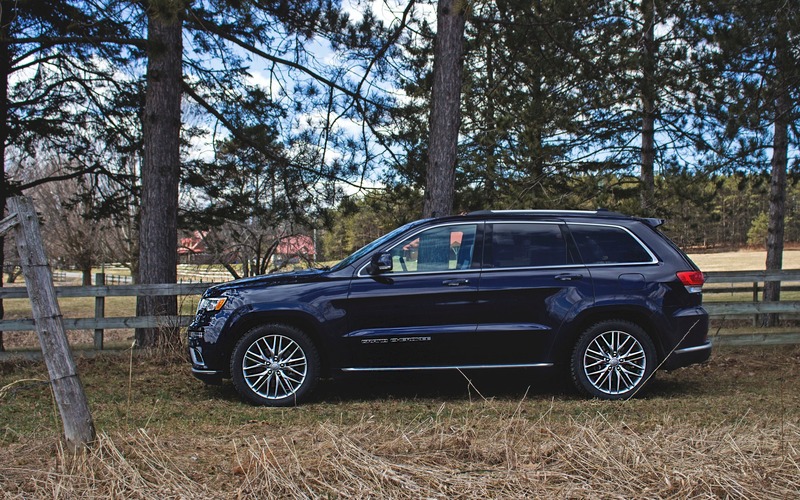 Ironically, the 2018 Jeep Grand Cherokee’s steering is precise and well weighted; resulting in what is nevertheless an overall enjoyable highway cruiser. Obviously, where the Grand Cherokee shines is on beaten paths, where its supremely competent four-by-four system gives way to a total of five drive modes: Snow, Sand, Mud, Rock, and Auto. The system of course includes lockable front and rear differentials as well as a two-speed transfer case and hill decent control. The air suspension adds a clever ride height adjustment setting through three different heights, notably lowering to low-rider clearance to ease entry and exit. It also automatically adjusts itself at highway speeds to a gimmicky-named Aero stance. As cool as all of this is, we fear this suspension won’t last long once the warranty expires. That all being said, even with its fancy shoes on, the Grand Cherokee remains a seriously competent go-anywhere rig that’s best suited for outdoorsy folks or active families. Except this one, in Summit trim, actually works for the active individuals who also need to wear a suit and tie during their 9-to-5 commute. Uconnect, FCA’s infotainment system, remains one of the best out there thanks to its clear and easy-to-comprehend menus, precise haptic feedback and handy redundant physical controls. Its biggest quality is how FCA engineers manage to tailor the system to the vehicle in question. In SRT cars, you get Performance Pages to adjust the car’s go-fast toys to your liking. In a Jeep, you get Off Road pages, which allow you to fiddle throughout the Grand Cherokee’s various settings and drive modes in order to better attack that next boulder or plow through that massive snow bank. And it’s all done in absolute simplicity and common sense only Detroit could have conceptualized. So as far as figuring out if the Jeep Grand Cherokee is worth considering over a Volvo XC90, BMW X5, Land Rover Discovery, or even Acura MDX, here’s the blunt answer: it’s less refined, less fuel efficient and less spacious overall inside than all those trucks. But that doesn’t prevent it from being lovable. Like many of FCA’s current cars and trucks, the 2018 Jeep Grand Cherokee gets the job done in a rudimentary, yet very charming kind of way. If it were invited to a fancy cocktail party, it would be the over-trained linebacker wearing a fitted suit. As goofy as he may appear, he’d be the most charismatic fellow there, ending up getting the entire guest list on his side from laughing at his fart jokes. 5/10	We recorded a 13.5 L/100 km average. For a V8, it's decent, but some V6 or turbocharged competitors pull better numbers. 9/10	Summit trim endulges occupants in massive leather chairs. Adjustable rear seat is comfortable for adults, but overall cabin leans on the small side. 8/10	That 5.7L HEMI V8 knows how to brawl, allowing for a spirited 0 to 100 km/h acceleration time of 6.5 seconds. 10/10	Uconnect is one of the best systems in the industry. Menus are clean, simple and easy to understand. Redundant physical controls are appreciated. Off Road Pages are a cool gimmick for adventure junkies. 5/10	This is not a sporty SUV. Body roll is high in the bends and the entire chassis is easily unsettled by uneven pavement. 7/10	Often dubbed America's Range Rover, in Summit trim. the Grand Cherokee couldn't be closer to that claim. While a bit rough around the edges, it chamingly combines luxury, brawn and off-road capability in an attractive package.